I have something not so spooky for you for Halloween. Are you ready? 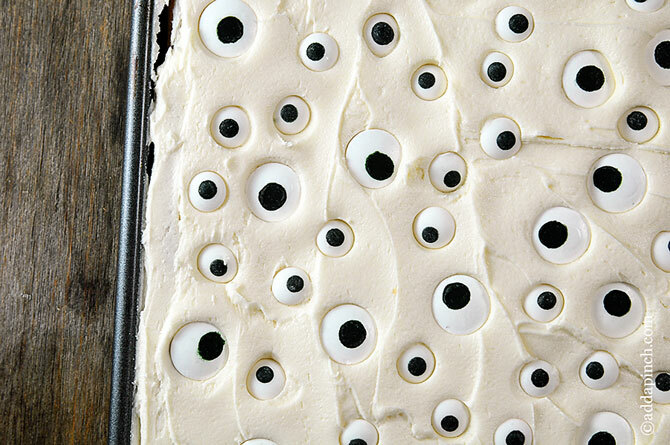 It’s this Eyeball Cookie Cake and it really couldn’t be any simpler to make. Easy, peasy should be in this cake’s name somewhere. You know. I have to admit something to you. I’m sort of squeamish when it comes to Halloween. Blood, gore, and gross things and I just aren’t friends. I’m more of a dress as your favorite person in history or drape yourself in a sheet with eye cutouts than I am interested in zombies, werewolves, or those freaky masks that make your face look like it is bleeding. Those things give me nightmares for real. 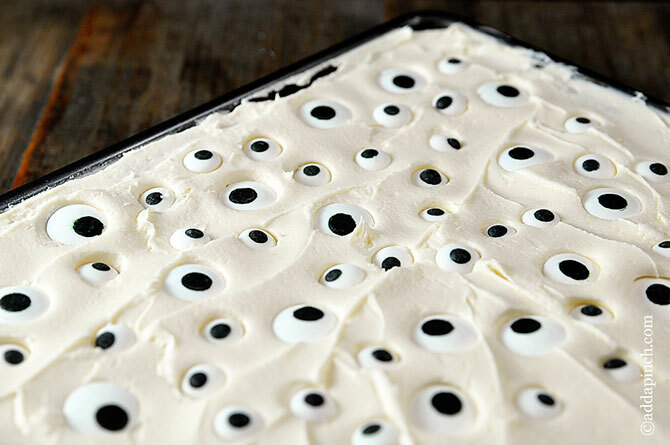 So, I thought this Eyeball Cookie Cake would be the perfect thing to share for my like-minded friends out there that are looking for a cute way to bring a little Halloween cheer without all the spooky, scary, gross, and gory. And let me tell you, this cake is one of those cakes that kids love helping you make and love even more helping make disappear. Delicious. Easy. Fun. Happy. Not scary. Cute. Little Buddy helped me whip up this cake the other day and has since asked me if we could make it for just about every event he can think of leading up to Halloween. 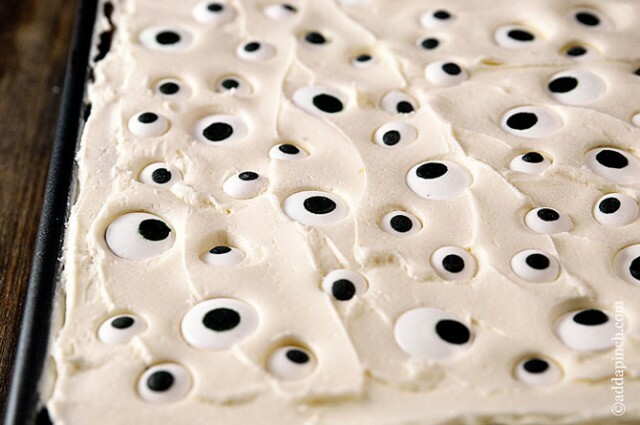 So much so, I think I need to buy stock in these fun candy eyes or start making them myself from royal icing. Either way, I need a huge stash of them he’s wanting to make this cake so much! And it is just now the beginning of October! So, are you ready to hear my secret for making it? You are going to love me for it. Yep. I used two rolls of Pillsbury Sugar Cookies as the base topped with my favorite fluffy white buttercream frosting. 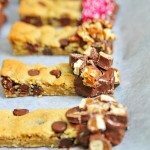 It makes it a cookie cake and those are often some of my son and his friends favorites. 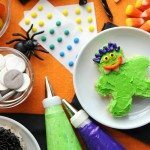 Children can easily help you with these steps of pressing the sugar cookie dough onto a rimmed 9×11 sheet pan, then once it has baked and cooled, they can help with the fun of decorating, too. While I used my homemade fluffy vanilla buttercream to make this cake, you could easily just use pre-made frosting in vanilla or another of your favorite flavors to make this cake decorating even easier. Totally your call there. No judgement from me! Heh. 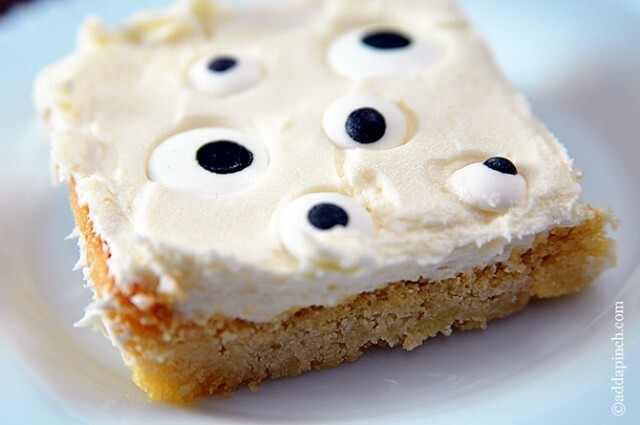 Once you have a nice thick layer of frosting on your sugar cookie, begin adding these fun eyes all over the top of the cake. I like to press them in gently so that they look like they are popping out just a little bit from the frosting. They look cuter that way, in my opinion. 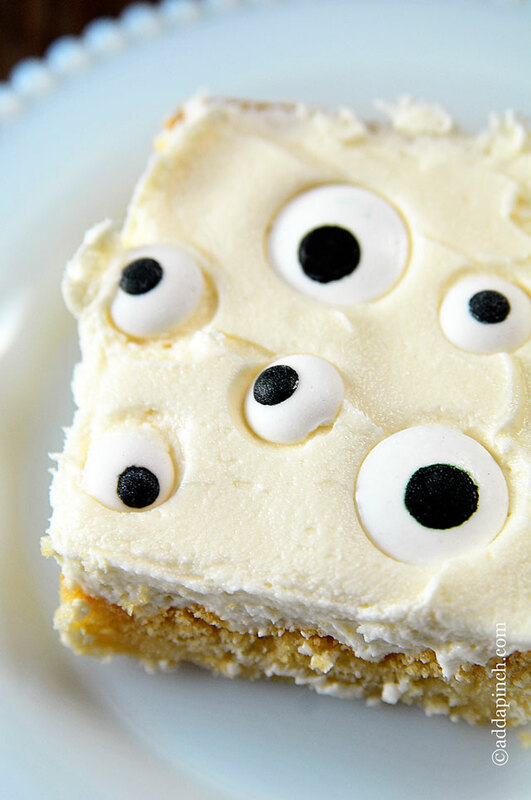 Once you’ve added all of your cute little eyeballs all over your cake, you are ready to serve it and hear squeals of laughter. Promise. Just look at that cuteness. Oh, and the best part? It’s just good, clean, not so scary Halloween at it’s best. Here’s how I make this Eyeball Cake. You’ll love it. 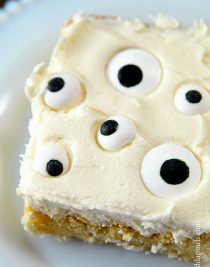 This Eyeball Cookie Cake is a fun and not so scary way to bring a little bit of Halloween cheer to any event. 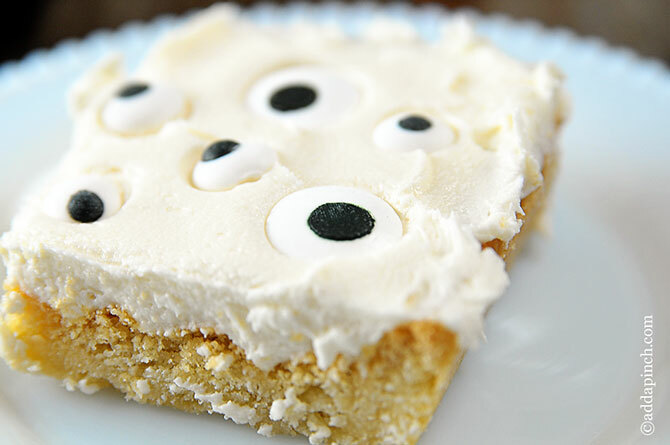 Get this simple recipe for a Halloween cake children are sure to love. 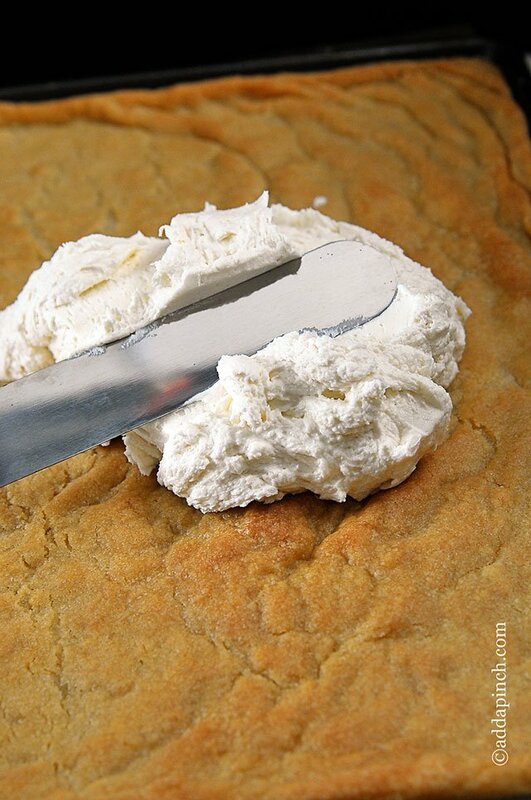 Press sugar cookie dough onto the bottom of a rimmed 9x11 sheet pan. 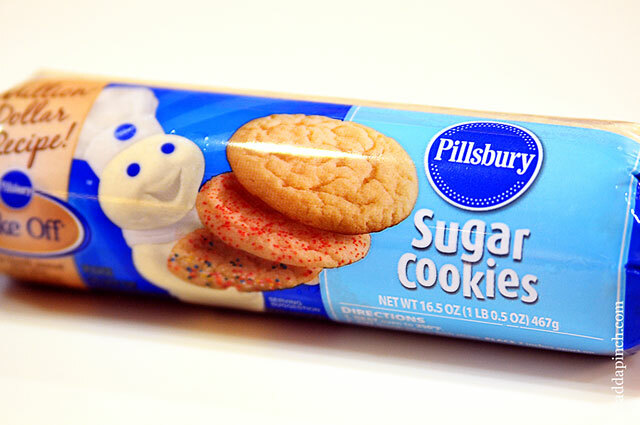 Bake for 15-18 minutes until cookie has turned golden brown and is cooked throughout when tested with a toothpick. Remove from oven and allow to cool completely. Spread a thick layer of frosting on top of cooled cake. Place eyeballs of varying sizes all over the top of the cake. Press in gently to secure the eyeballs on the cake and to make them appear to pop out a bit. Store covered or cut and in an airtight container. Okay this is just so stinking cute! Um, so cute, so fun and perfect for Halloween! I love it! What are the eyes made of and where can I find them? 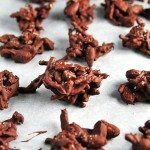 They are made out of sugar and I’ve included links in the recipe where you can find them. Hope you enjoy it! This is so fun! I’m so not a spooky/gory person, either, but this I can definitely handle! So freaking cool!! Passing this on immediately. Thank you Robyn! Adorable and easy — love it! This is so adorable cute and creative! I totally want to put these in my kids’ lunches next week. Love this!!! Very cute! I might make this for my book club this week. I love Halloween themed desserts, but most of them are way too complicated and colorful for my liking. I love how simple this is! I love this. Think I might tint the frosting green or purple to make the eyes pop. Thanks for the inspiration, Robyn! Do you grease the pan? I’m scared the cookie dough is going to stick if I use my glass pyrex. Thanks! So cute and easy! I’m thinking about making this with a Christmas theme for the holidays!